An independent, international competition to recognize excellence in the film and video industries. Recognizing outstanding achievment in Digital Video. Excellence for exceptional work produced by media professionals. sales awards in the music industry. The Arden Awards competition honors creative professionals whose exceptional work distinguishes them above others. Recognizing excellence in Audio/Visual Production. Honoring the best of video, film, print and web. Honoring the creative excellence of smaller agencies and companies worldwide. Honoring excellence in moving pixels. 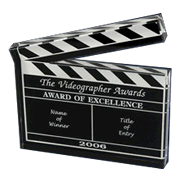 Saluting outstanding work in video, film, TV, print, web-design, audio, and advertising. Furthering excellence in the communications industry. Judges in seven countries. International award honoring production & video communication skills raising industry standards.